This is a Ctrlr panel for the Yamaha TG33 synthesizer module, which is a simple Single Voice edit buffer editor. By edit buffer editor, I mean that this panel has no “save” or “library” features, so you still need to save your edits the old-fashioned way on the TG33 itself. Load a patch from the TG33 into Ctrlr. Edit the patch. Note: the panel is bi-directional. Edits made on the TG33 will sync with the panel. Save the edited patch using the TG33 panel controls. I may continue to work on this panel to add new functionality, but no promises. Developed and tested on Ctrlr version 5.4.29.
thanks for making this panel Paul! 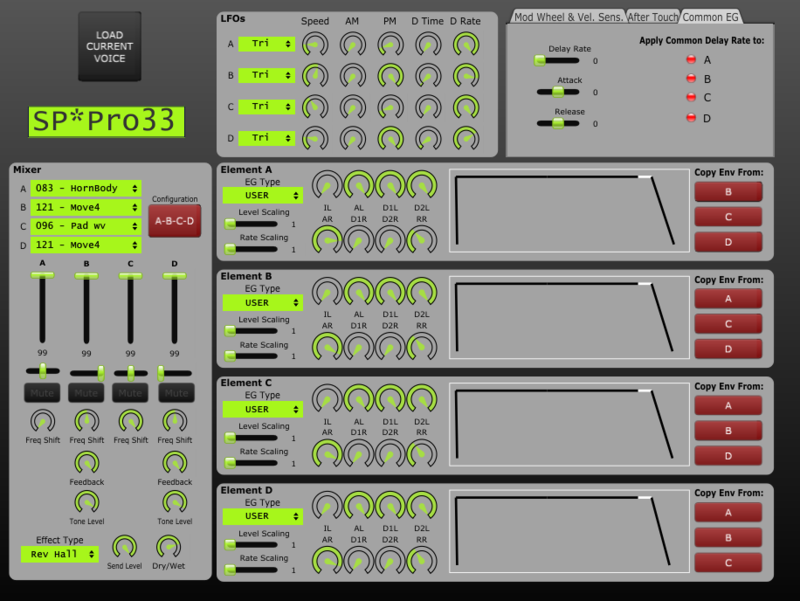 i’m running on ctrlr 5.3.198 (OSX) and my TG33 is syncing up but only some functions seem to work – for example, the EG presets work, but not the knobs for the various envelope parameters.. also freq shift, feedback, tone level don’t work for me. everything else seems to. any tips or things i could be doing wrong? i really appreciate any help and love the design with the envelope graphs and the mixer section.